Hyderabad: In a move that has raised the hackles of Sultan Bazar traders, the Telangana government has backtracked on its insistence for a change in the alignment of metro rail route near the State Assembly and Sultan Bazar, and has now given the green signal to L&T Metro Rail (Hyderabad) Limited (L&TMRHL) to go ahead with the construction as per the original plan. Hours after this announcement, the Sultan Bazaar Traders Association called for a bandh in the area on Friday, to be followed by an emergency meeting to chalk out their strategy. “This (government nod) was orally communicated to us by the state government that we should go ahead with the original plan,” L&TMRHL chief executive and managing director VB Gadgil said. Addressing a press conference after inaugurating sample station retail outlets and walk around display of advertising boxes at the Nagole station on Thursday, Gadgil said that works would be taken up as per the original plan and there would not be any change in the alignment at the State Assembly and Sultan Bazar. Regarding the change of alignment in the old city, which is for over 3 km, he said that discussions were going on at the state government level. Chief Minister K Chandrasekhar Rao had earlier objected to the alignment of metro rail passing through Gun Park opposite the Assembly building and the Sultan Bazar market. He had announced on the floor of the State Assembly that the heritage structure of the Assembly, Sultan Bazar market and the old city would be protected by changing the metro rail alignment at the said places. 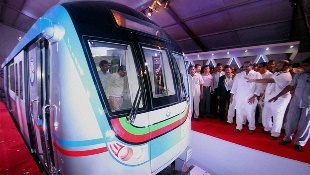 As per the Chief Minister’s direction, Hyderabad Metro Rail authorities prepared draft realignment plans and submitted the same to the state government. The proposed realignment was to run from the backside of the Lakdikapul railway station, DGP’s office, Assembly, Jubilee Hall, Lalitha Kala Thoranam and outside the Telugu University gate. To protect the 100-year-old Sultan Bazar market as well as traders, HMR prepared an alternative route that was to run behind Koti Women’s College and Osmania Medical College. Regarding the old city metro stretch, HMR proposed a new alternative route through Musi River, Salarjung Museum, Puranapul, Bahadurpura, Eidgah Mir Alam, Tadban and Shamsheerganj to Falaknuma. When asked about the delay in acquiring properties at certain places, Gadgil said it was the responsibility of the HMR to hand over the land to them. It is for them to take up the issue with the Greater Hyderabad Municipal Corporation (GHMC) and other government departments concerned to acquire properties, he explained.